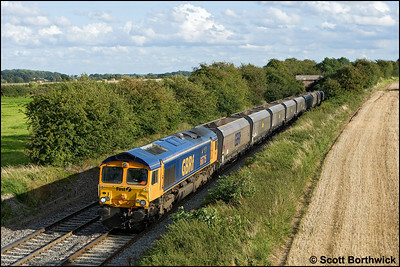 Fresh out of Glasgow works after a repaint, 66709 pilots 57003 as it passes Cathiron on 13/07/2002 whilst in charge of a diverted 4O29 1238 Trafford Park-Southampton MCT. 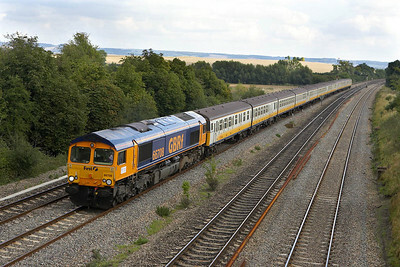 The train was diverted via the WCML due to engineering work between Banbury & Oxford. 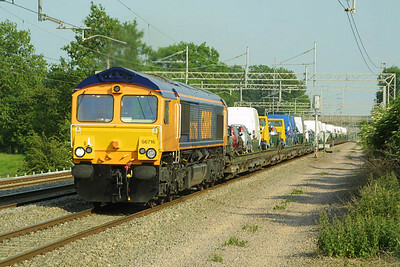 66709 piloted the 57 from Crewe Basford Hall as far as Willesden in order to get the loco to Willesden TMD where the finishing touches to the livery would be applied, which can be seen later on in this collection. 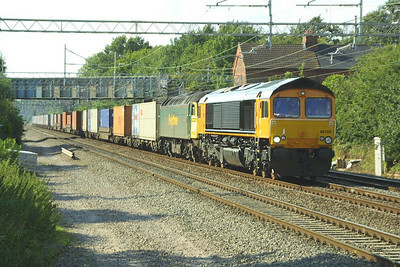 On hire to Freightliner Heavy Haul, GBRF owned 66716 is pictured passing Cathiron on Friday 13th June 2003 in charge of 4M26 1421 SX Dagenham-Crewe Gresty Road. 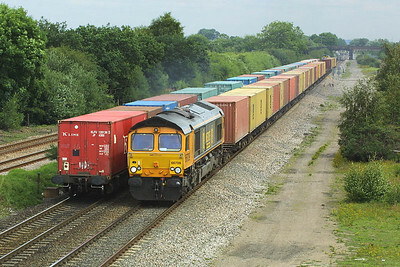 Container trains pass at North Stafford Jnct on 24/07/2004. 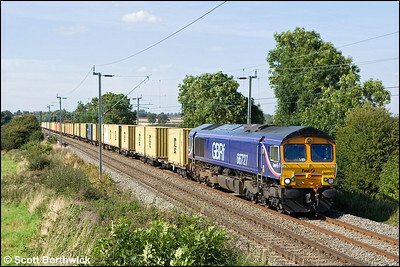 66709 heads 4M21 0543 Felixstowe North FLT-Hams Hall as it passes a diverted 4L93 0822 Trafford Park-Ipswich Yard headed by 66501. 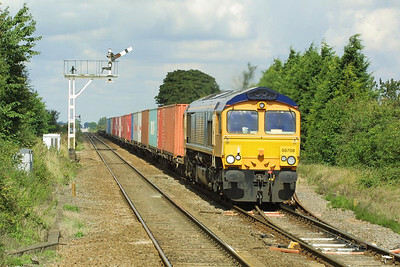 66708 powers through Manea on 21/08/2004 with 4L25 0625 Hams Hall-Felixstowe. 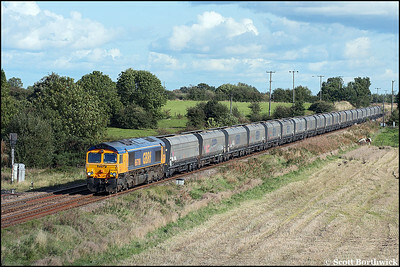 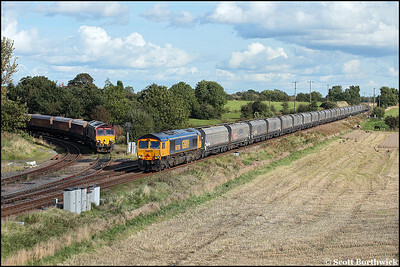 66708 passes South Moreton on 20/09/2005 with 6V91 1040 Shoebuyness-Newport Docks. 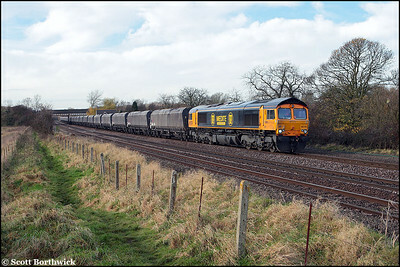 The train conveyed 4-VEP's 3586, 3412 & 3496 for scrapping. 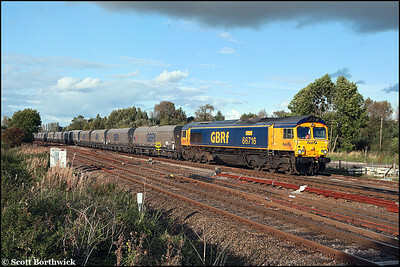 66717 races northwards at Cathiron on 10/05/2006 with 4M23 1059 Felixstowe North FLT-Hams Hall. 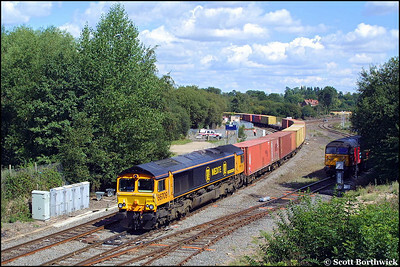 66716 has a well loaded 4M23 1059 Felixstowe North-Hams Hall in tow as it passes Brinklow Loop on 08/06/2006. 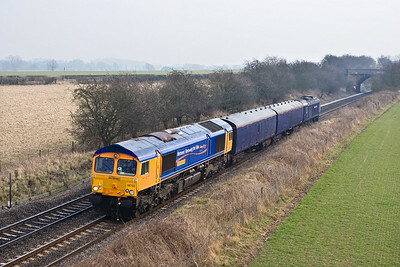 66722 passes Portway on 20/02/2008 hauling HST power car 43133 back to Brush Loughborough as 5Z90 1100 Old Oak Common-Brush Loughborough. 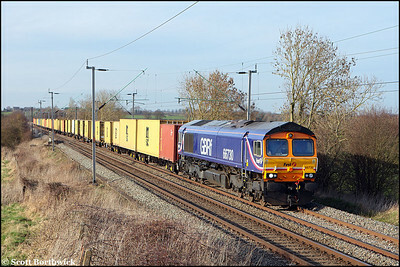 66730 passes Long Buckby with 4L22 1516 Hams Hall-Felixstowe North on 16/03/2009. 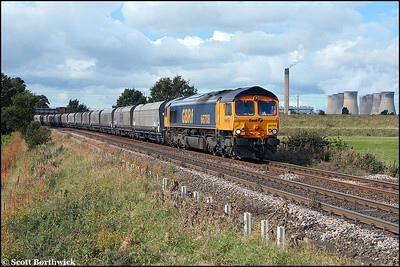 66717 'Good Old Boy' approaches Whitacre Junction with 4N68 0430 Doncaster Down Decoy-Daw Mill Colliery on 03/06/2010. 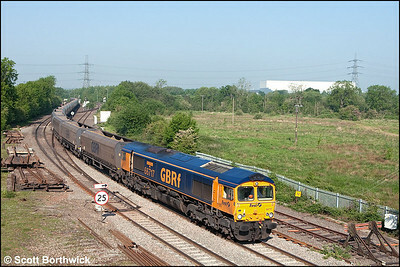 The old track panels to the left are from the recent relaying and slight re-alignment of Whitacre Junction. 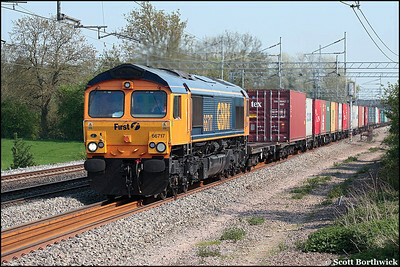 66712 'Peterborough Power Signalbox' hauls 6096 1025 Mountsorrel Sdgs-Eastleigh East NY at Hatton on 19/04/2011. 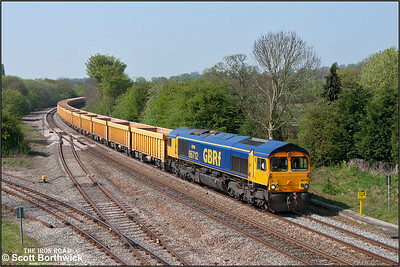 Unusually, only the rear most wagons were loaded. 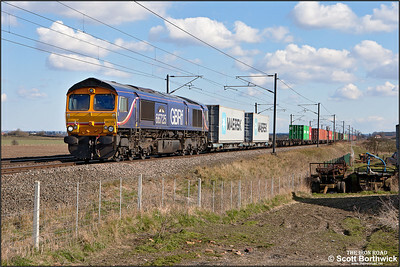 66725 'Sunderland' passes Broad Fen Lane, Claypole whilst working 4E33 1120 Felixstowe South-Doncaster Railport on 03/04/2013. 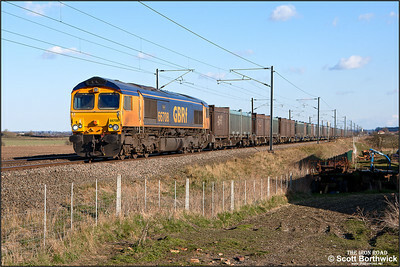 66708 'Jayne' hauls 4E19 1130 Mountfield Sdgs-West Burton Power Station passing Broad Fen Lane, Claypole on 03/04/2013. 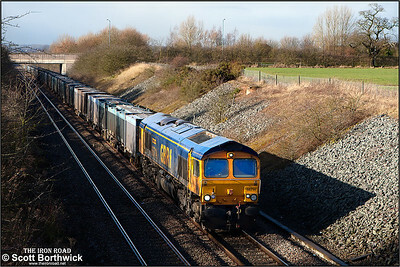 66714 passes Wheatcroft Farm, Nuneaton whilst working 4G80 0816 MO Rugeley Power Station FGD-Hotchley Hill on 10/02/2014.